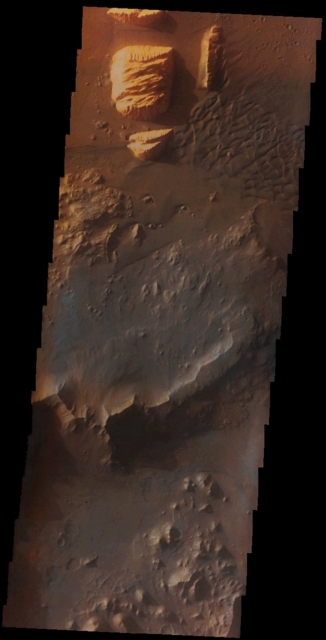 In this beautiful (and, in a way, "romantic") VIS image, taken by the NASA - Mars Odyssey Orbiter on December, 8th, 2002, and during its 4.359th orbit around the Red Planet, we can see a small portion of the huge Canyon known as Ganges Chasma. Ganges Chasma is a deep and steep Canyon located at the Eastern End of the Great Valles Marineris Canyon System. It was so named, as you can easily understand, after the River Ganges. In fact, and as far as we know for now, Ganges Chasma is thought to have formed through a (VERY long) series of Catastrophic Discharges of both Water and Carbon Dioxide (---> CO2) that, most likely, were coming from Chaotic Terrains - such as the one (still quite well preserved) known as Ganges Chaos and located at the Southern Margin of Ganges Chasma. Most of the evidence for these abovementioned Catastrophic Discharges - and the ensuing collapses of the Ground - is believed - by Planetary Scientists - to have been washed away. However, prior to developing an outlet that joined Capri Chasma - and the connected Outflow Channels to its East -, Ganges Chasma may, at some point in the Noachian Era, have contained a large Lake which, slowly, drained Northward, through (partially) Subsurface Pathways, until all its Water arrived to Shalbatana Vallis. Just out of curiosity, please notice how beautiful the light-colored and deeply striated Rocky Outcrops (watch at the upper left - Sx - side of the image) appear in the white/orange lights of a Sun that, at the time when the picture was taken, was very low on the Local Horizon. This image (which is an Original Mars Odyssey Orbiter falsely colored and Map-Projected frame published on the NASA - Planetary Photojournal with the ID n. PIA 19211) has been additionally processed, magnified to aid the visibility of the details, contrast enhanced and sharpened, Gamma corrected and then re-colorized in Absolute Natural Colors (such as the colors that a normal human eye would actually perceive if someone were onboard the NASA - Mars Odyssey Orbiter and then looked down, towards the Surface of Mars), by using an original technique created - and, in time, dramatically improved - by the Lunar Explorer Italia Team.